Alvin during recovery with swimmers Carl Wood and Ryan Dahlberg. (Photo by Mark Kurz). We arrived at the first dive site at 8:40 in the morning and Alvin was in the water by 9:20. The six-day transit from Bermuda gave us plenty of time to plan the first dive, so everyone was ready to go and we were all relieved to get here and get started without wasting a moment. The launching of Alvin takes a coordinated effort on the part of the Atlantis crew, the Alvin Group, and the science party. 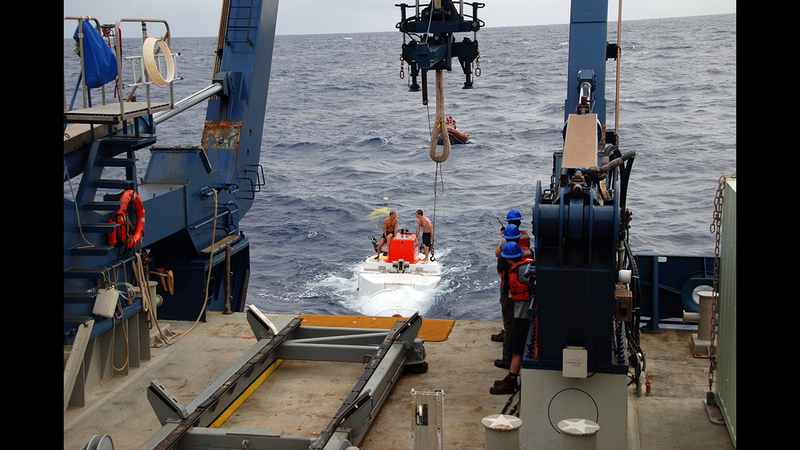 The sub moves from its hangar onto the ship’s fantail along a track on the deck and, once the Launch Coordinator’s checklist is complete, the pilot and two science observers get into “the ball” and the hatch is sealed. Atlantis’ special A-frame then lifts Alvin from its cradle and lowers it into the water, where two swimmers assist with readying the submersible to dive. After a final OK from the Alvin pilot, the swimmers on the small boat, the Captain on the Atlantis bridge, and the Alvin control room, the pilot releases air from the sub’s ballast tanks and the dive begins. 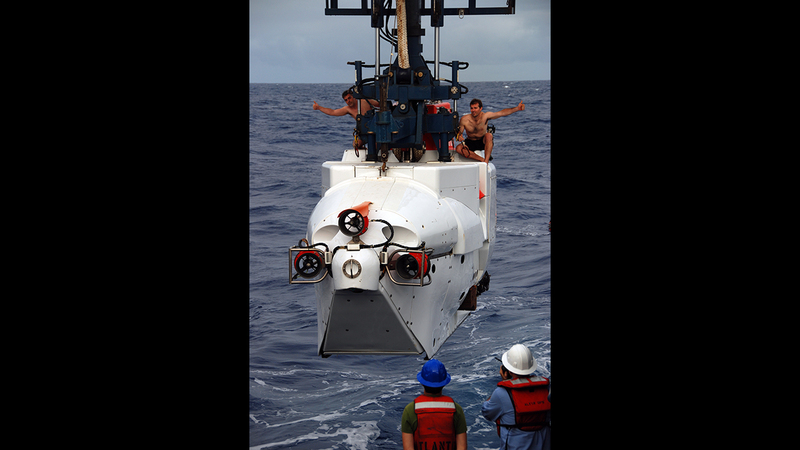 The first dive picked up right where we left off in 2016, with the same mission objectives: to understand the distribution of popping rocks on the ocean floor and how they are formed. Popping rocks are gas-rich lava flows that trap high-pressure bubbles as the lava cools to form basalt. These bubbles actually “pop” when they reach the lower pressure on the deck of the ship, giving the rocks their name. Popping rocks are unlike any other known volcanic rocks in for the fact that they have such high concentrations of carbon dioxide. 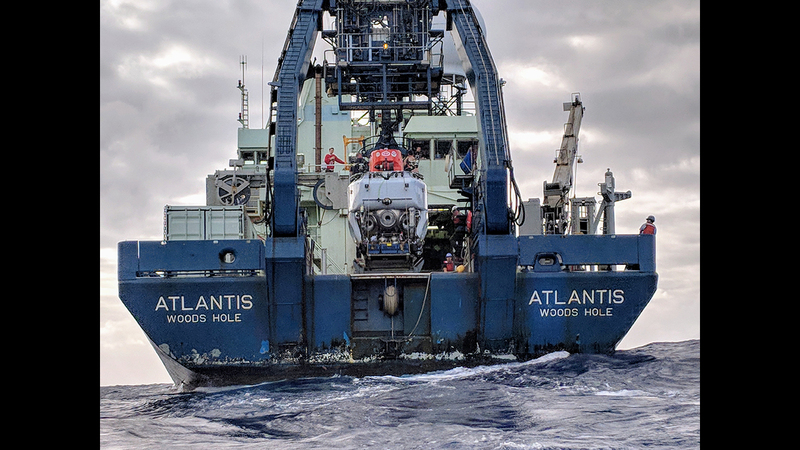 The first divers were me, Mark Kurz, the Chief Scientist of the cruise; Adam Soule, the Chief Scientist of the National Deep Submergence Facility that operates Alvin and Sentry for the ocean science community; and the pilot, Jefferson Grau. 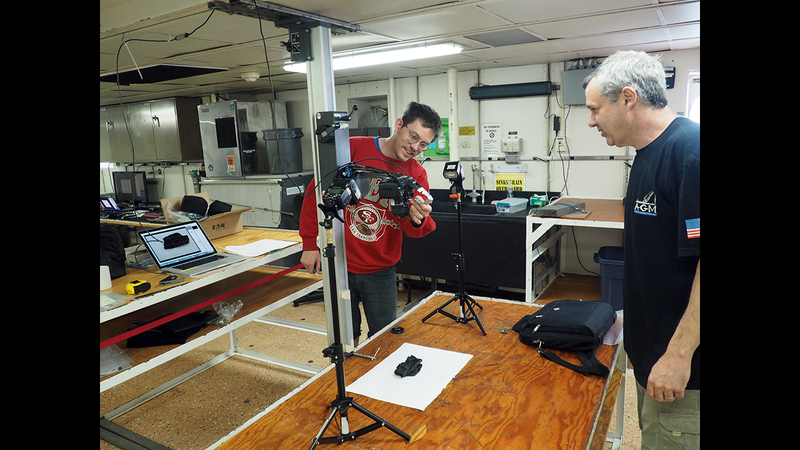 It has been some time since Alvin was last on a science dive, but everything worked extremely well, thanks to the hard work and professionalism of all the people involved, particularly the nine members of the shipboard Alvin Group, headed by the Expedition Leader Todd Litke. We returned to the surface with 12 rock samples and were very happy to hear the sound of a “pop” shortly after the first rock came out of the sub’s sample basket, an indication we are on the right track. Everyone on the ship was relieved, and a lot of us made our own noises to mark the occasion, mostly cheers and laughter. Now the real work of our voyage begins.